I wouldn’t have believed it could happen to me. I’d read articles about how difficult repatriation is, but I always imagined it happening to those who’d lived abroad for many, many years. I’d only lived overseas for two, short years when I decided to come back to the States to more fully participate in my only child’s upcoming wedding. After the long journey home with my belongings, I rested and adapted to jetlag in Dallas, Texas for four weeks. During that time, I saw friends and family and house-sat for two different friends in their beautiful homes. As lovely as this was, living out of a suitcase becomes old. I then flew to California, where my daughter lives, and had a very loose plan to stay with her until her wedding in January. I brought enough clothes to last through the changing seasons. I walked everywhere, just as I was used to doing in Istanbul, but found after about a week, I was getting restless. I attended a few meet-ups and art outings. I began looking for possible employment. For the first time ever, I began to feel that my age was a factor in both job-seeking and social outings. Then I signed up for Obamacare health insurance. Wow! Expensive! The reality of living in the USA began to infiltrate all my thoughts. I could see that my savings would quickly disappear if I did not find a job. I initially thought of working for Starbucks or Trader Joe’s for a few months, until after the wedding. I’d always heard these companies had good benefit packages, but what I didn’t consider was the fact of no vacation and horrible hours. For example, after researching Trader Joe’s, I learned that an employee shift can last until midnight and begin the next day as early as 4:00 am. Three hours of sleep? No, thank you. Within a few days, I began to reconsider living in California without a job. Several of my good friends live in Santa Fe and were working hard to convince me to move there for a few months. 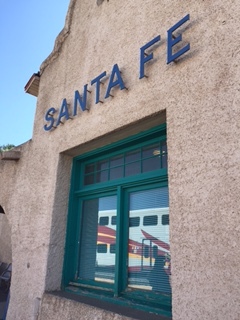 I’d visited Santa Fe a couple of times and found it interesting with its many cultural offerings and I thought it might be a good place to be through the fall; halfway between my daughter in San Diego and my mother in Dallas. I decided to try it, so I bought a car and drove to New Mexico! I have only just started to explore what this small city has to offer in terms of cultural explorations, and I think, actually, there are many. I love having a car and the fact that I can arrive anywhere in this city in less than 15 minutes. There’s a Trader Joe’s and Whole Foods here and I’ve discovered red and green chilies. There’s an art movie cinema, and farmer’s market. I’m curious to learn about the history of the Native Americans and the Spanish explorers. My long-term friends who live here have been so generous, kind and encouraging. They’ve allowed me to vent frustrations and sadness of repatriation. I’m continuing to help plan my daughter’s wedding. Everything is coming together. It will be joyous and I’ll be able to easily meet her in Dallas for a planned bridal shower. I continue to be grateful to live in a city with friends. The skies are amazing with the enormous swirling, painted brushstroke clouds. The yellow color of the sunflowers has grabbed my attention and the rainbows here are vertical. It’s weird. A good friend just told me of a place called Tent Rocks, less than an hour away. Suppossedly, it looks like Cappadocia, Turkey. Dear Anita, your writing hit a deep chord in me-art teacher/traveler now wife/mom. I taught art in Athens Greece for 2 wonderfully transforming years and struggled with a rough transition acclimating back in the states. It’s been 15 years since Athens and now being married and a mom, I’m feeling the itch again to get overseas. I want my son to experience life abroad and my husband is open to it. I’m not willing to give up my fantastic teaching job in the states and am going to request a sabbatical for 2017-18. Fulbright teacher exchange lost it’s funding. I’d like to be in touch with more art teachers who’ve found a way to reinvigorate themselves and their professions overseas and was wondering if you’ve since found any other blogs/programs/exchanges that have allowed you to teach and travel without the 2 year committment of an overseas school. Any thoughts would be appreciated. Your last blog seems to be a year old, I hope your are still writing-I’m curious if you are still in NM-wonderful place to be an artist. I appreciate your words. I have been thinking about writing on my blog again. Perhaps this will prompt me to do it! I’m going to send you a PM. Anita, you have so many friends, a wonderful support system. I’m heartened by your exploration. You’ll find the good wherever you go. I know it will go fast. I’m good at change but there’s been more than my quota I guess. The last two weekends have been fun; I’m settling in. It’s starting to get better. I have just begun to explore. I’d love you to come visit anytime! Sorry it’s been rough for you Anita, but if ever there was a small town for you, it would be Santa Fe. (I know it isn’t really small per se, but compared to IST…. One of the former MEF principals lives there with his family. Yann Lussiez, he is quite active in the theatre… you should look him up! I hope and pray it gets better for you. Hang in there. Wow Anita….what a ride you have been on! Best wishes to you! Sometimes when the going got tough, I’d pretend to be an anthropologist practicing participant-observation. It gave me a little distance while letting me do my job. Great advise! I’d love to catch up. Taiwan must be treating you well! Wow Anita, what an interesting life and experience you’re having. I look forward to catching up with you in SF sometime. Thanks for the update! Hi Heather! Great to hear from you. I’d love our paths to cross in SFe!